Ooh, San-ti Cazor-la – You Will Be Sorely Missed. New Author 14th January 2018 Arsenal, fans, football, GoonersphereTagged cazorla, Legends, midfield, santi2 Comments on Ooh, San-ti Cazor-la – You Will Be Sorely Missed. Santiago Cazorla joined our club in 2012. He was part of a trio of big signings in the summer of that year – along with German international hotshot Lukas Podolski and Le Championnat winner Olivier Giroud – and his acquisition was a coup of sorts. Most La Liga afficianado’s were of the opinion that his destination was Barca or Real Madrid-bound, but Arsene Wenger acted quickly. He knew how much Cazorla would bring to his team. Since then, the Spaniard has made one hundred and fifty five starts in an Arsenal jersey, with thirteen substitute appearances in all competitions. If he manages to acquire another fifty Premier League appearances, he will be in the Top Twenty for Arsenal. In his time at The Emirates, the little magician has earned a slot in Gooner’s hearts through his two-footed skills on the pitch and his infectious and impish smile. His adaptability, his technique, rightfully belong on the highest stage and he has been responsible for many escapes from the ignominy of defeat. It isn’t only his club exploits that have taken centre stage. Since the year of his joining Arsenal, he has taken on a more pivotal role for La Furia Roja, rather than the superfluous part he had played up until the World Cup of 2012. It seems that it isn’t only Arsene Wenger and Gooners who recognise the genius of Cazorla. So, he has a growing number of appearances for Arsenal, he has established himself in the Spanish national team, and he has caused the Gooner faithful no end of throat ailments through singing his name. In the future though, what will be Santi Cazorla’s lasting legacy? Will we remember him as one of the finest exponents of the game? When recalling halcyon times, we go to players such as Dennis Bergkamp, Thierry Henry, Charlie George and Liam Brady – the players who were capable of the explosive and who could change the path of a match with one deft flick of a boot. The men who averted disaster with a pass, the heroes who decided fate with a missile of a shot. These icons have gained immortality of sorts, as their exploits will forever be played in the memory banks of their adoring public. Surely then, Santi Cazorla warrants remembering fifty years from now? This isn’t a claim that Cazorla merits being spoken in the same breath as these legends of Arsenal. Just that Santi deserves to be remembered. How will he be remembered though? How does he muscle his way into the proverbial Hall Of Fame? Are the dazzling moments of genius and improvisation the sole requirement for entering the echelons of greatness? Simply put in some excellent performances and you’re given a ticket to the VIP section? Players such as Andrei Arshavin have performed footballing montages, and will be fondly remembered as a game changer, but he doesn’t belong with the esteemed company of the players I mentioned earlier. The wily but lazy Russian didn’t make enough appearances, he wasn’t consistent, but crucially, he didn’t win a single thing in his time at Arsenal. What transforms a player from fans favourite, a cult hero of sorts, into one of the titans of the team, is glory. The players who were true giants for our club held silverware in front of Gooners. Santi Cazorla did the same. In fact, if it weren’t for Cazorla’s timely intervention in the form of his free-kick which sliced through the air and gave a frail-looking Arsenal side something to stabilise themselves with – the 2014 F.A Cup may well have slipped past them. Arguably, without this drought-ending trophy as a foundation, it could be called into question whether we would have triumphed in last year’s competition. The monkey we carried on our back was growing heavier with each passing year and was responsible for the infirm approach we adopted in the first twenty minutes Versus Hull City. 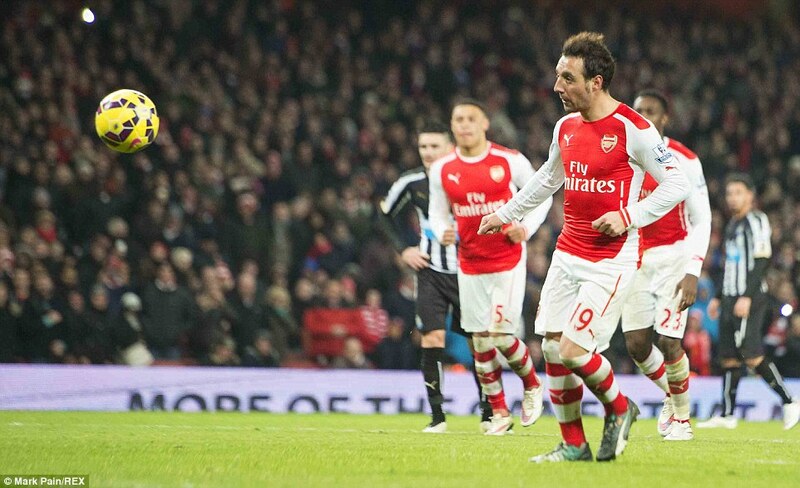 Santi Cazorla’s free kick belonged in the top corner. That was where its home was. There was no goalkeeper who would have stopped it coming home to roost. It was a goal which gave the Gunner’s scrabbling fingers some purchase, and how telling it was Santi Cazorla who bestowed hope upon his teammates and Gooners alike. He has many talents, a plethora of strings to his bow. Like an Hispanic Robin Hood, he can destroy his enemies with a flurry of arrows. These arrows represent his two-footedness and his ability to switch from defence to attack in a swift movement. The fact he can use his left as well as his right foot means that when a marker approaches, he is immediately guessing which direction he should close down. It is an advantage from the very start. There is another arrow though, that he possesses. Much like Laurent Koscielny and Alexis Sanchez, he has an asset that swings the most important of matches. For when it comes to crunch time, Santi Cazorla steps up. In the biggest games, it is he who can make the difference. The Cup Final against Hull City is the prime example, but many people will forget the role he played in the Champions League Qualifier ties with Besiktas. In recent memory, there hasn’t been many matches filled with more tension and angst. The reward meant that the quality was dwarfed and sent to the shadows whilst every player would have the repercussions for loss reverberating in their mind as they took to the pitch. These games were the start of Santi Cazorla’s rebirth. The diminutive smiler initially struggled when his preferred position of Number Ten was taken from him by the arrival of Mesut Ozil. He flitted in and out of games as he was pushed out to the flanks in order to accommodate not only the German, but also Santi’s talents. It was these games though, that saw him take a more intrinsic role in the team. No one was aware of his defensive talents but he was responsible for quelling many attacks that could have spelled disaster for the Gunners. Santi’s positioning, his rapport with the ball, his tenacity, led Arsenal to hold onto a 1-0 aggregate win and the inevitable cash windfall that Champions League Group Stages brings with it. His reinvention from playmaker to all-round engine saw him once more take centre stage. A player of his ilk needs to play and right in the centre of the pitch is ideal for his skills. Some may point to his spots of low concentration – those moments where a player lets the game pass him by – but the mark of an important player is how much they are missed when they are absent from the side. Santi Cazorla is currently crocked until at least February/March. I sincerely hope that Aaron Ramsey can fill the gap left by Cazorla, as I am an Arsenal fan first and foremost. In my mind though, I fear that with our team bereft of the little man who can turn defence into attack so quickly, we may struggle. So, does Santi deserve a place amongst the greats? Not yet. He does however, warrant his own song which is sung in every game. If he continues in the same vein as he has since he joined, then he can rub figurative shoulders with our other heroes. I love Santi. He’s affectionately known as Stump y Legs in our Gooner household. Being vertically challenged myself I feel more of a connection with him. There’s a reason why Mesut Özil put Cazorla in his World XI. He’s genuinely world class. His close ball control is immense. Watch him wriggle his way into space. It’s a sight to behold. Get well soon Santi. We need you!